Check out my etsy store too here. I am 9 sales away from my 100th sale! The lucky 100th buyer receives a FREE minky washie trio (of their choice of colors). If you don't know what minky is... it is one of the softest fabrics known to man!!! Super soft for baby's sensitive skin, but strong enough to use on yours too! Already a follower. Just stopping in from FMBT. Hope to hear from you soon! following you now via TTA, follow me back if you want! Hi there. 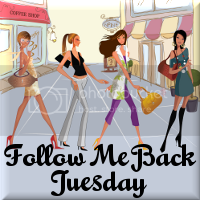 I am following you as part of Trailing Tuesday. Please come by and visit me if you get the chance. I found your blog through Tuesday Tag-Along, and I follow you now!